I read an article about a patient in Taiwan who was having irritation and pain in one eye. The patient, only identified by the family name “He” was a woman… So, yes, He was a she. 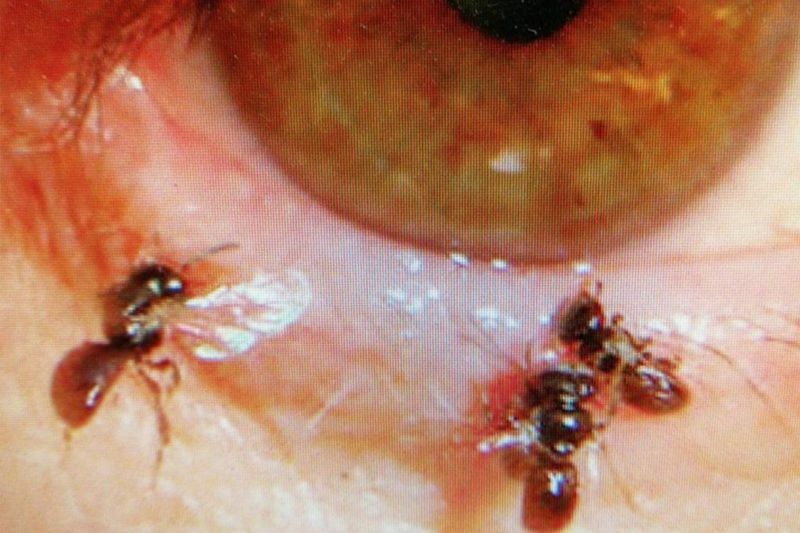 But, more important than that cheap, but oddly satisfying, joke was what they found in her tear duct: Tiny bees… sweat bees. Most of you have never heard of sweat bees and are saying, “a more repulsive name I’ve never heard”; a much smaller group of you HAVE heard of sweat bees and are saying, “Sweat bees? Tell me more”. Well… A sweat bee is any insect in the family halictidae with the exception of those who are just using that name to escape their creditors. There are over two thousand species within halictidae, enough to circle the globe seven times if their sense of direction holds up. They come in a variety of colors to match any eye. Sweat bees are eusocial. This means that their social hierarchy is as advanced as it gets without a bicameral legislature. They have a well-established queen, a division of labor and printing presses. Like yellow jackets and very confused birds, sweat bees tend to nest underground. These nests have vertical tunnels with passages leading to the egg chambers and, just past that, the sauna. Sweat bees can be cleptoparasites… and you know what THAT means… I hope. Some sweat bees find the larvae of another bee species, kill them and lay their own eggs in the same chamber. 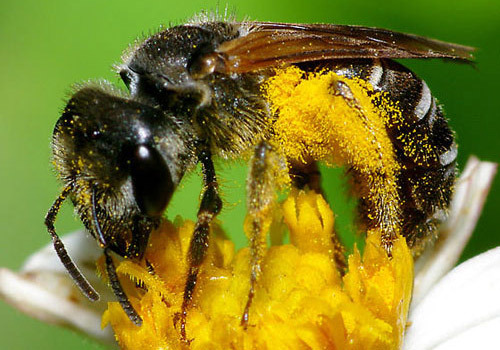 After the sweat bees hatch, they kill the other nursery occupants and eat up the host’s food. That makes them seem like the world’s worst house-guests; but, if a sweat bee is a guest in your home, and you don’t have any bee eggs or larvae, the worst you can expect is that one of them will spend too much time in the shower. A quick flush of the upstairs toilet will take care of that. Sweat bees mostly come out at dusk… often in their robes and looking very disoriented. They can pollinate plants that other bees can’t, either for physical reasons or just a cultural incompatibility. Females carry the pollen in their tibiae or femurs, so stockings are out of the question… no matter how feminine they make the bee feel. The males have no stinger. The females can sting but only if squished; otherwise, they are pretty philosophical about their encounters with people. so why did these bees left the queen and the nest to reside in He’s or her duct? Very true. The photo came from a news article, Deb. Well there you go. What next, maggots in ears? I might. It’s my job to inform the public. Perhaps he/she just needed a good cry to wash the bees out of her tear ducts. May I suggest The Notebook for future occurrences? Gena Rowlands is a delight…. I really think you ought to write all ‘non-fiction’ animal articles from now on. I wrote enough for a book but I couldn’t sell it… Hence, this website! It isn’t important to sell it but it IS important to show it to people. Most writers feel that way, right? 🙂 Story of my life. That’s really interesting. Gross/disturbing, but interesting. NextWhat Random Thoughts Hath God Wrot?